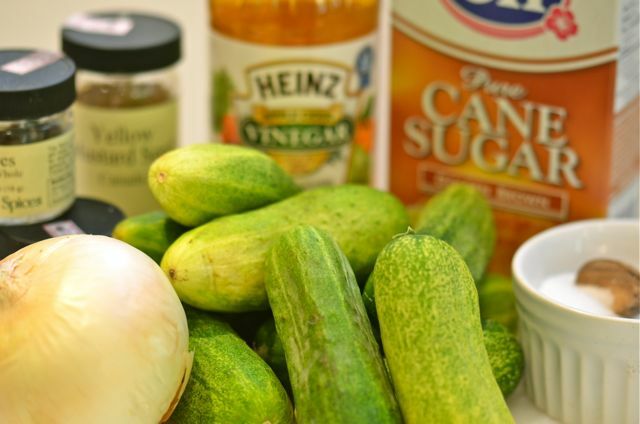 As for the sweet refrigerator pickles, we love our cucumbers fresh, or in quick pickles, but we like this recipe so much it is one of the main reasons we grow cukes and buy a lot at the farmers market. Making these pickles is a snap. Simply cut up some pickling cucumbers (Kirbys are good here) and a bit of onion and then quickly/lightly cook in a solution of brown sugar, vinegar, salt and spices. Let the mixture cool and then put it in the fridge, the pickles will keep for about 10 days, but they won’t last that long. The pickles are sharp, sweet and crunchy with just a touch of spice. We eat them out of hand but also put them on sandwiches or serve them with burgers and hot dogs at cookouts. We also chop the pickles up into a quick relish- so good. And our kids love them, so it is a good way to get a few more veggies in their diet. Slicing cucumbers with a sharp knife can be fun. A quick simmer with the vinegar mixture and off to the fridge. If you have slightly old or unattractive cherries, this is a great way to extend them. Any variety of sweet or sour cherry will work here. What You Get: “Real” maraschino cherries that are great in drinks and dessert. Not too sweet, but full of flavor. What You Need: Maraschino liqueur. Luxardo is the most common, but others will work as well. A cherry-pitter is a good investment. If you do not have a cherry-pitter, here is another technique. How Long? 10-15 minutes. And then wait for two days. This is a very easy dish to make. Place the liqueur in a saucepan over medium heat and bring to a simmer. 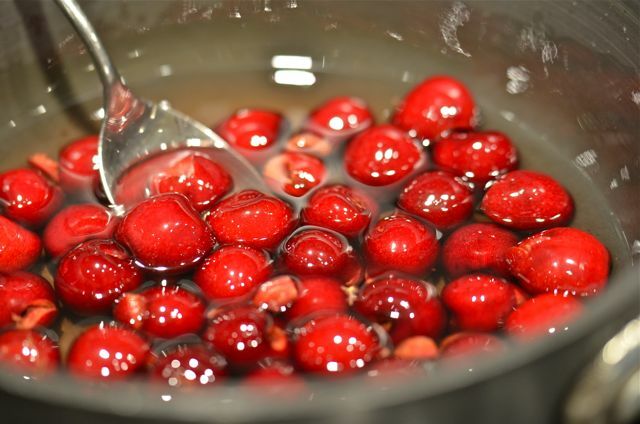 Take the pot off the heat and then add the cherries. Stir to coat and allow to cool. Put the mixture in a very clean (or sterilized) jar and then in the fridge. Allow the fruit to macerate in the liqueur for two days and then serve. Keep the cherries and liqueur together in the fridge. They will keep for at least 2 weeks. No notes- this is easy, get started! 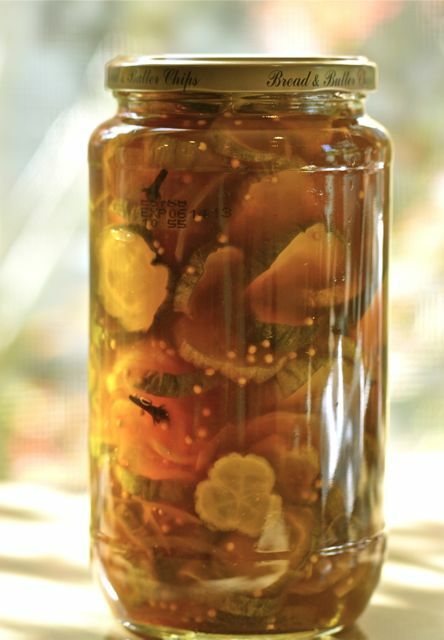 What You Get: Quick, tasty, sweet and sour pickles. Great on sandwiches or eating out of hand. How Long? 15-20 minutes. You can makes these anytime cucumbers are in season. 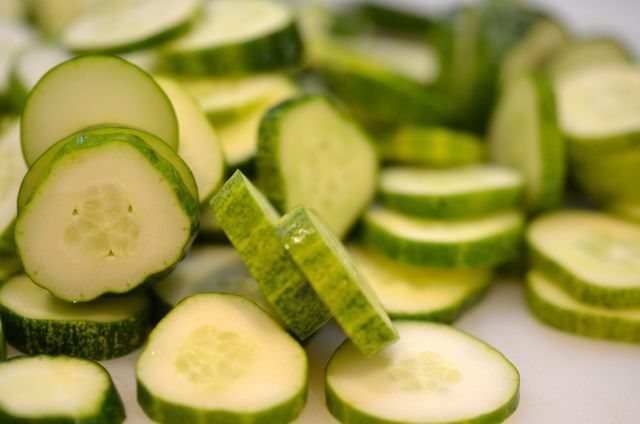 Slice the cucumbers into 1/4 inch rounds. Thinly slice the onions lengthwise. In a large saucepan, over medium heat combine the vinegar, sugar, salt and spices. Stir to combine and bring to a boil. 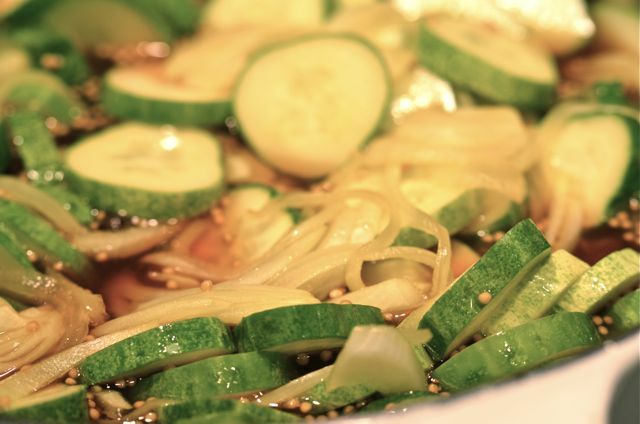 When the sugar and salt are dissolved add the cucumbers and onions and lower heat so the mixture simmers. Simmer the mixture, stirring occasionally, until the cucumbers darken slightly, about 5 minutes. Remove from the heat and allow to cool. Then place the pickles in very clean (or sterilized) jars and chill in the fridge. Serve. Wait a minute. I can make my own maraschino cherries? Genius. I bought cherries yesterday so I might try this one… sounds funny and they may be amazing on top of some ice cream! 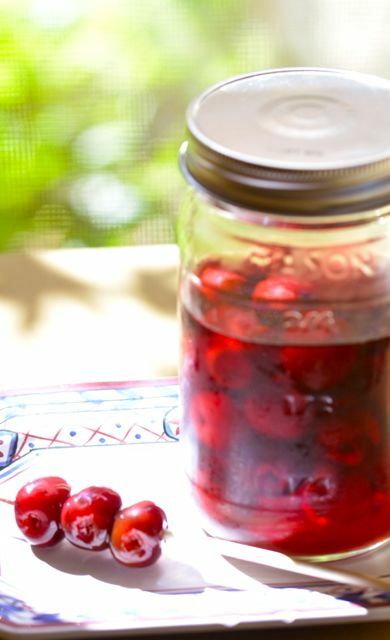 One doubt, do you keep the cherries in the fridge with the jar full of liqueur or without? Good question. The liqueur stays with the cherries. I will update the recipe- thx! Thanks. Funny you mention that..we are looking at a few things for peaches. Usually we just eat them, but this year we will have a surplus. Ice cream wil be the first option (the pectins in the peaches make for great texture in ice cream), and then tarts and pies. Or you can just muddle peaches with bourbon and a touch of lemon and perhaps a splash of sugar…hard to go wrong. The muddling sounds good, heading to Edisto Beach so that sounds like a great combo to sip on the screened porch! Thanks. Thanks for the mention! I am excited to try these cherries; cherry limeade anyone? I just made a different kind of fridge pickle this week too; look for my post next week for my claussen knock-off pickles. I grow cucumbers but this is the first year I’m growing gherkins or cornichon specifically for pickles. Needless to say I can’t wait! Hey there, thanks for the mention! I will try to get to some boozy cherries soon, I’ve got marionberries to pick this weekend. Believe it or not, I have never made cherries with maraschino liqueur. I usually use brandy, amaretto, and have tried creme de cacao and even rose wine. Maybe it is time for me to do something different… But I’m thinking bourbon. Bourbon would certainly work, but I also like the sound of amaretto w. the cherries..nutty flavors and cherries work well. 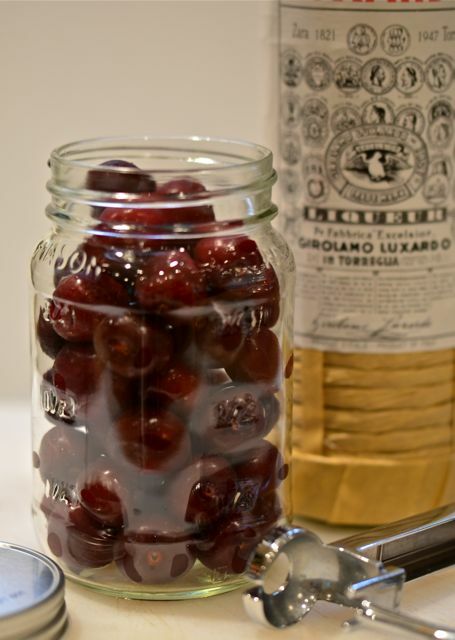 I’ve been doing my cherries with rum, but I guess Maraschino liqueur is logical 😉 Anyway, I’d rather go cherryless than use one of those store-bought, so-called maraschno cherries. Good work! I love the sound of those maraschino cherries! The store bought ones are so gross and it never even occurred to me that you could make them at home. Great post! Homemade maraschino cherries? Genius. Pray tell, where do you find maraschino liqueur? The person at the liquor store thought I was crazy. Do I just need a better liquor store?